Gentas Group adopted investment in technology, quality, personal, enviornment and future, as the principle has recently become a worldwide company known through its innovations and quality. Thanks to its trademarks, professional sales network and experienced personel offered to the world in a larger scale in direction with being utilized for human and the environment stripping of the cliches of the laminate, GENTAS achieved the success of being widely preferred in 45 countries of the world. GENTAS LAMINATE performs production in 50.000 m2 - closed areas by putting new HPL, CPL and IMPREGNATION facilities into service. As a result of large scale investments performed GENTAS LAMINATE is included among the limited number of world companies with its annual laminate production capacity of 24.500.000m. High efficiency R&d team thanks to technologic investments and closely following the advancements all around the world developed G-EXT after long years of hard work, which is a modern, technologic, practical and aesthetical product and will be a new trend in the construction sector. 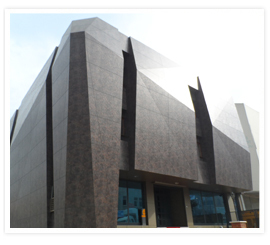 G-Ext, which is a new generation product developed for construction and all kinds of siding applications, is one of the most powerful brands of Gentas in terms of quality. GENTAS, working closely with the world's most important and dependable accredited companies in terms of certification, is one of the few companies around the world performing production in accordance with the highest quality level EN 438-7 and European Norms Compliance 'CE' in addition to the certificates abtained for its product.